Last week, the Grassroots Mobilization team welcomed the last of the Stone Ridge School of the Sacred Heart sophomore class to our office for a “How to Lobby” Presentation before taking them up to Capitol Hill to visit their federal legislators. Beginning in October, we (Erin Sutherland and Alannah Boyle, Grassroots Mobilization Associates) have had the opportunity to train and accompany the entire sophomore class at Stone Ridge on dozens of lobby visits. In each visit, we taught the sophomores about the importance of Family Friendly Workplace policies, including paid family medical and sick leave. Right now, there are two great bills going through both the House and Senate: The Healthy Families Act (H.R. 1784/S. 840) which guarantees workers the right to earn sick days to care for themselves or a family member, and the FAMILY Act (H.R. 1185/S. 463), which provides workers the opportunity to access paid sick leave. Through Stone Ridge’s Social Action program, a group of approximately ten sophomores visited the NETWORK office every other week for the past seven months. It is only at the end of this program that we see the magnitude of our reach. Alannah Boyle, Grassroots Mobilization Associate, presenting to Stone Ridge students. “I had not gone on a lobby visit until I started working at NETWORK. 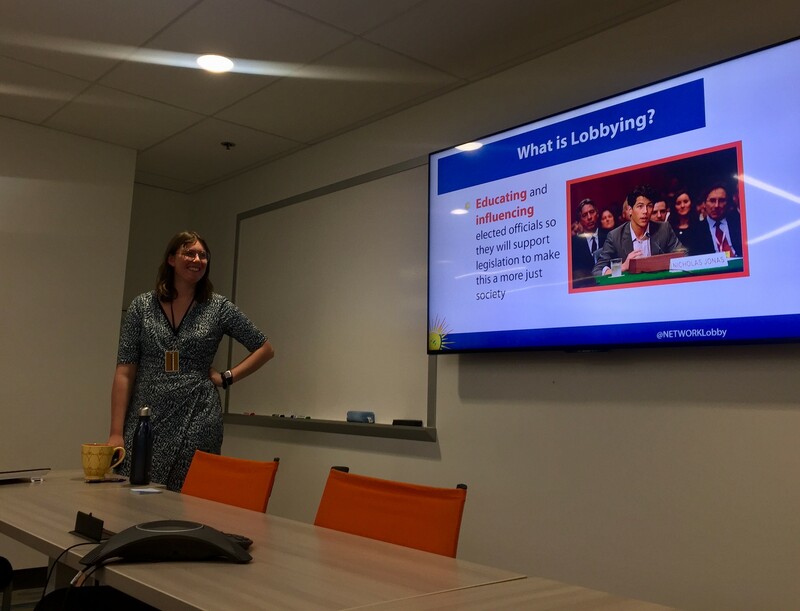 For me, when I had heard of lobbying in the past, the word connoted meeting of special interests, of wealthy people in suits, speaking more eloquently on issues than I could. However, after going to my first lobby visit in coalition (and with coaching from Sr. Quincy Howard, Government Relations Advocate at NETWORK) this past fall, I realized that the only thing needed for a successful lobby visit and sincere conviction in an issue I cared about. Alannah and I tried to pass on these two important skills to our students by staging mock lobby visits with lots of contingencies (what if we need to meet in the hallway, as is common? Or if the staffer we meet with tries to change the topic of our visit?) to help make the girls prepared and confident for whatever could come their way. We also talked with the students about how, as women, the right to paid family and medical leave has or will affect us personally at some point in our lives, between becoming a parent, to needing to take care or a relative, or taking time off in the wake of personal trauma. This entry was posted in Front Page on April 18, 2019 by alannah. The Dream and Promise Act of 2019, H.R. 6, was recently introduced in the House of Representatives. This legislation establishes a roadmap to U.S. citizenship for (1) immigrant youth and (2) current or potential holders of (a) temporary protected status (TPS) or (b) deferred enforced departure (DED). The bill provides conditional permanent resident (CPR) status and a roadmap to lawful permanent resident (LPR) status and, eventually, U.S. citizenship for immigrant youth who entered the U.S. before age 18, have four or more years of residency, and graduated from high school (or the equivalent). In addition, it provides an opportunity for people who currently have or who may be eligible for TPS or DED who have three or more years of residency to apply for LPR status and, eventually, U.S. citizenship. This common sense legislation mends the gap in access to citizenship and allows our immigrant sisters and brothers to receive legal protections that will allow them to continue to thrive. Dreamers, TPS, and DED holders have lived in the United States for years. They are an integral part of our society. For example, in 1990, Salvadorans were given TPS and many have lived in the United States since then. Individuals from other countries were also given similar protection in response to emergency conditions in countries impacted by war, famine or natural disaster. Likewise, Dreamers have lived the majority of their lives in the U.S. and some have been protected by DACA since 2012. DACA, TPS, and DED programs have allowed these immigrants to work in the U.S. and shielded from deportation. In return, they have contributed billions to our economy, started American families, and integrated into American culture. How does H.R. 6 help immigrant youth? Longer CPR status. Extends the length of CPR status from eight to ten years to give applicants more time to fulfill requirements. Expands stays of removal. Stays the removal of minors who are not yet eligible for relief but may become eligible in the future and who temporarily unenroll from school. Better hardship standard. Permits people with CPR to obtain LPR status without satisfying the employment, military, or educational tracks if their deportation would cause “hardship” to themselves or immediate family members (instead of “extreme hardship”). Apprenticeship eligibility. Includes apprenticeship programs as a qualifying education to obtain CPR status. No medical examination. Eliminates the costly medical examination for applicants. 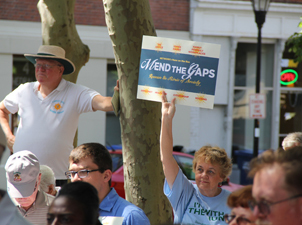 Caps fee. Establishes a fee ceiling of $495 for immigrant youth applying for CPR status. Professional licenses. Clarifies that people with CPR can access professional, commercial, and business licenses. Career and technical education. Permits people with CPR who obtain a certificate or credential from an area career and technical education school to obtain LPR status. LPR status. Provides LPR status to CPR holders who: (1) serve in the uniformed services for two years, (2) complete two years at or obtain a degree from an institution of higher education, or (3) work 75 percent of the time in CPR status (with flexible evidentiary burdens such as affidavits). Removes barriers to in-state tuition. Makes it easier for states to provide in-state tuition to immigrant students. Federal financial aid. Establishes that CPR-holders are eligible for federal loans, work study, services, but not grants. How does H.R. 6 help people with TPS or DED? LPR status. Provides LPR status for people with TPS or DED (and those who were eligible but did not apply) who apply within three years from the date of enactment if they (1) had at least three years of continuous residence (as well as residence since the date required the last time that the person’s nation of origin was designated) and (2) were eligible for or had (a) TPS on Sept. 25, 2016, or (b) DED on Sept. 28, 2016. This includes nationals of 13 countries: El Salvador, Guinea, Haiti, Honduras, Liberia, Nepal, Nicaragua, Sierra Leone, Somalia, South Sudan, Sudan, Syria, and Yemen. Inspection and admission. Classifies people with TPS or DED as inspected and admitted for the purposes of Immigration & Nationality Act (INA) section 245(a), making it easier to obtain LPR status through existing channels (e.g., a family-based petition). Stay of removal. 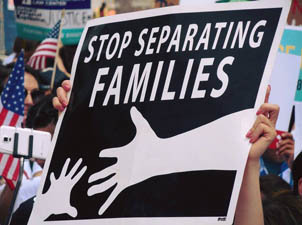 Stays the removal (deportation) of individuals while an application is pending. Caps fee. Establishes a fee ceiling of $1,140 for people with TPS or DED applying for LPR status. Transparency for TPS. Requires the secretary of the U.S. Dept. of Homeland Security (DHS) to provide an explanation for and report within three days of publishing notice to terminate TPS designation for certain nationals. How does H.R. 6 help both immigrant youth and people with TPS or DED? Deported immigrants eligible. Enables certain immigrant youth deported under the Trump administration and people who had TPS or DED who were deported as of September 2016 to apply for relief from abroad. Protections for detained and non-detained. Allows immigrants in deportation proceedings, including those in detention, to apply for relief under the INA and protects eligible applicants from deportation. Administrative review. Provides robust administrative and judicial review of denials. Grant program. Establishes a grant program for nonprofit organizations to assist applicants. Fee exemption. Provides a narrow fee exemption for applicants who meet certain requirements. Advance parole and employment authorization. Allows individuals with a pending application to apply for advance parole and employment authorization (a work permit). Adjustment through existing channels. Clarifies that individuals may apply for LPR status through existing legal pathways, such as through family- or employment-based sponsorship. Confidentiality provisions. Protects the information submitted by applicants (and all DACA requests) from disclosure. NETWORK is working to get every Democratic member in the House to co-sponsor the bill and to find Republican co-sponsors as well. Now is the time for all of us to ask our Members of Congress to support H.R. 6. This entry was posted in Front Page, Immigration on April 17, 2019 by laura. On March 14, NETWORK Senior Government Relations Advocate Tralonne Shorter spoke at a press conference with Rep. Rosa DeLauro, Senator Patty Murray, Rep. Lauren Underwood, and Rep. Alma Adams about the introduction of the Healthy Families Act. View photos of the press conference on NETWORK’s Flickr account. At NETWORK we are working every day for the dignity of the common good: urging elected officials, including the President, to join us on our mission to put people over profits. We not only advocate for social justice on Capitol Hill, but we also are a leading example of family-friendly workplace policies that reflect the current and future nature of families and women in the workforce. 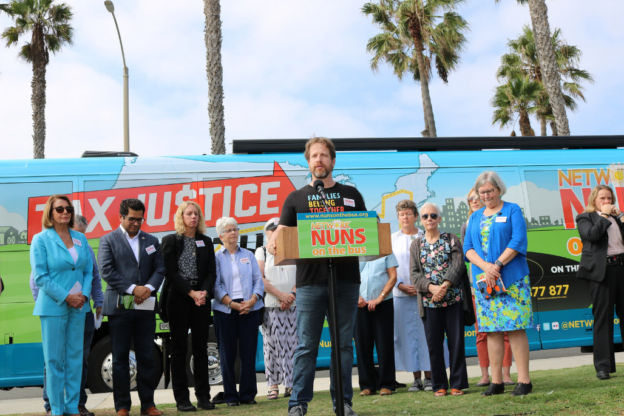 Inspired by Catholic Social Justice, we believe that workplace and labor policies must respect the dignity of every human being, and recognize the needs of every human being to be in community with one another. In our advocacy for family-friendly workplace policies, we have focused on guaranteeing that all workers have access to paid family leave and sick leave, ending the gender and racial wage gap, and encouraging flexible scheduling to give employees and employers more tools and resources to create mutually beneficial schedules. Current bills coming up in Congress include issues that support national paid family and medical leave insurance programs (Family and Medical Insurance Leave [FAMILY] Act), as well as setting a consistent standard for earning sick days (Healthy Families Act). It is our hope that the successful passage of these bills will enable more workers to access necessary time off that would allow them to care for themselves and their families. The patchwork of existing workplace policies is not a sufficient safety net for workers and their loved ones. Just 17% of workers in the U.S. have access to paid family leave, and only 40% of workers can take paid personal medical leave. The private sector is making strides in offering family-friendly workplaces, but those protections are not enough on their own and often leave out the lowest-paid workers. The United States is the only industrialized nation that does not provide universal paid leave benefits, making time off inaccessible to lower-wage workers. While 92% of the highest wage earners has access to paid sick leave, only 31% of the lowest earning workers can take paid sick time. The Healthy Families Act and the FAMILY Act would serve as two major solutions to promoting family-friendly workplaces, and upholding workers’ inherent dignity in allowing paid leave. As people of faith, we value an economy that puts people, not profit, at the center. We know that when the people at the economic margins of our society do better, we all do better. The Healthy Families Act would set a consistent standard for accruing sick days: workers would earn a minimum of one hour of paid sick time for every 30 hours worked, up to 56 hours (seven days) per year. Additionally, the act would enable workers in businesses with fifteen or more employees to earn up to seven job-protected, paid sick days each year. These sick days would allow people to recover from illnesses, access preventive care, provide care to a sick family member, or attend school meetings related to a child’s health condition or disability. The FAMILY Act would provide workers with up to partial income to take time for their own serious health conditions, pregnancy and childbirth recovery, care of a family member, birth or adoption, or military caregiving needs. The act covers all workers—part-time, lower-wage, and self-employed workers are all eligible. All companies are covered, no matter their size; the paid leave would be funded by small employer and employee contributions that amount to 2 cents for every $10 in wages. The Healthy Families and FAMILY Acts not only contain provisions that would allow workers to earn paid sick days and family leave to care for themselves or an immediate family member, they also include important protections for victims of domestic violence, stalking, or sexual assault. No one should have to worry about losing their job while recovering from the trauma of intimate partner violence or harassment. These laws ensure every worker has access to the time they need to care for themselves and their loved ones. We know paid sick days work because we’ve seen them implemented in 10 states and 20 cities around the country. Providing family-friendly workplace protections is necessary to build an economy that puts people, not profit at the center. Catholic Social Justice teaches that workplace and labor policies must respect the dignity of every human being, and recognize the needs of every human being to be in community with one another. The right to work must operate in concert with human needs of community – and our government should institute laws to ensure family-friendly workplaces. Now is the time for Congress to pass the FAMILY Act and the Healthy Families Act, so that every employer can provide a pro-family friendly workplace that reflects the current and future nature of families and women in the workforce. This entry was posted in Front Page, Women and Families on April 17, 2019 by colleen. As the NETWORK community undergoes our Lenten journey through racial justice, we are committed to identifying how racism manifests itself through federal policy. While many are familiar with how racial injustices are perpetuated by our criminal justice system and immigration system, the racism embedded in our healthcare system may not be as evident. Our identity, and especially our racial identity, plays a huge factor in our physical and mental health. While we must continue to fight for accessible and affordable healthcare for all, that alone will not address the deep racial inequalities in health outcomes. When examining health systems, we must examine how our social location affects our ability to be healthy. Health care cannot be ignorant to identity, because our identity and social location affect both our access to healthcare and our ability to have healthy outcomes. The healthcare system tends to view people in a vacuum, and often fails to consider how culture, environment, or socioeconomic status affects health. For example, someone reliant on public housing assistance may struggle to get enough exercise when they live in an area that lacks recreational facilities like parks or rec centers. A person with a physical disability might lack the accessible transportation options to get to an appointment with a provider. Type 2 diabetes is difficult to manage living in a food desert with limited access to healthy food options. Many LGBT+ people struggle to find providers accepting of their sexual orientation and may forgo care if there are no safe options in their community. For a non-English speaking patient, a language barrier at the pharmacy can result in inaccurate information on how to safely use a prescription. 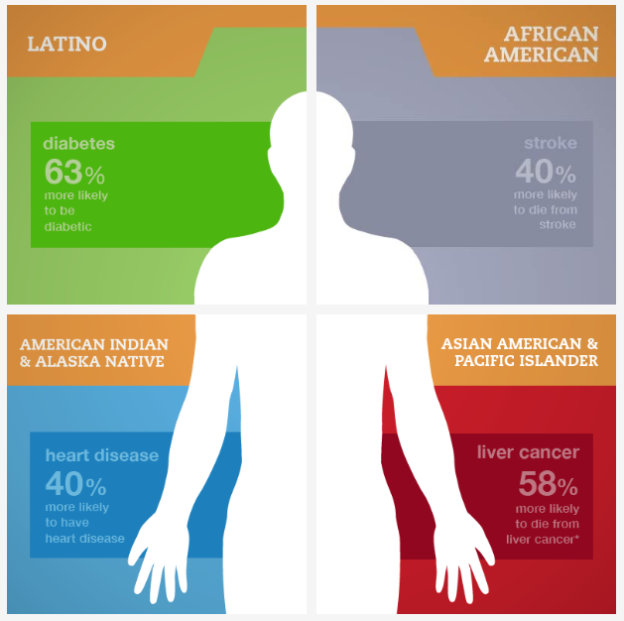 The data is clear– marginalized populations have worse health outcomes. While the exact causes of these outcomes is not completely definitive, it’s clear that these disparities are a result of structural barriers. Black women are four times more likely to die as a result of childbirth than white women. Despite a lower incidence rate of cancer overall, African-American women have a higher cancer death rate when compared to white women. While the opioid crisis is too-often framed as a “white problem,” U.S. opioid death rates for African-Americans have increased over twice as fast as death rates for white individuals. Like many other inequalities, society often individualizes the problem, blaming specific patients for their failure to “take care of themselves.” We have to break out of this culture of individualism. There are systemic inequalities at play. In fact, there’s a term for it— social determinants of health. The quality and accessibility of health care is only one determinant of health outcomes– other social determinants of health play a massive role. Things like the walkability of our neighborhoods, our access to early childhood education, and how much debt we carry have direct impacts on our overall health. Of course, people of color are disproportionately more likely to have poor social determinants of health. We have a shared responsibility to ensure everyone has the opportunity to be healthy– which means examining our solutions to our broken healthcare system through an equity lens. We cannot improve health outcomes just by looking narrowly at medical systems. We also cannot continue to approach health in a race-neutral way. The opportunity to be healthy will only be fair and just when we interrogate how systemic inequalities have literally sickened communities of color, and when we redesign those systems to be equitable to all. This entry was posted in Front Page on April 16, 2019 by siena. Responding to the signs of the times, people of goodwill have historically raised their voices on behalf of the common good. How the voice is raised – whether literally or figuratively, individually or collectively – is determined by a number of variables including the challenge and the desired outcome. Examples of these efforts include Mahatma Gandhi’s Salt March, Rev. Martin Luther King, Jr.’s Letter from Birmingham Jail, Marian Wright Edelman’s Children’s Defense Fund, and Bryan Stevenson’s Equal Justice Initiative. NETWORK, founded by women religious to lobby for social justice at the federal level, is a living model of speaking for the common good. In each instance, the action is inspired by the transcendent truth of human dignity and is viewed as an act of conscience, faith, or divine obedience. Depending on the circumstances, speaking truth may be accompanied by the grave risk of physical harm or death. In spite of the risk, people of goodwill are duty-bound to speak. In 1934 Germany, Bonhoeffer, theologian Karl Barth, and other Christians were greatly disturbed by the rise of Nazism, and the large number of churches who remained silent in light of the contrast between Christ’s teachings and Adolf Hitler’s agenda. These church leaders responded by raising a unitive in the Theological Declaration of Barmen that has since been embraced by a number of Christian traditions. Inspired by this historical document, the Living School students wrote and released Barmen Today: A Contemplative Contemporary Declaration with the full-support of their teachers: Rev. Richard Rohr, Rev. Cynthia Bourgeault, and Dr. James Finley. Known as the Barmen Today circle, the small collaborative group echoes Bonhoeffer by stating, “[B]ecause we want to remain faithful to both the Divine which we seek to understand and the Love which we seek to live, we choose to not be silent. We choose to speak and act.” Issued as an invitation to engage in both contemplative practice and nonviolent resistance, the text of the document speaks to common ideals and today’s challenges. Available in English and Spanish, Barmen Today has received more than 11,000 signatories since its release in August 2018. One of the signatories is songwriter and recording artist Alana Levondoski who was so touched by Barmen Today that she volunteered her talents to write and record “Divine Obedience,” the document’s theme song. According to Levondoski’s lyrics, “There comes a time for Divine Obedience.” Thousands of others join her and the circle in declaring this to be the time for Barmen Today. Will you? To read, sign, and share, Barmen Today, visit bit.ly/barmentoday. For information on the Living School, see www.cac.org/living-school/. 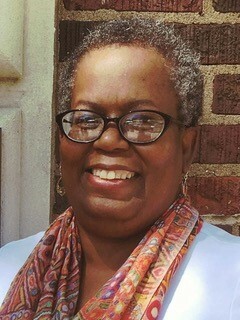 To learn about Alana Levandoski and her work, visit alanalevandoski.com. This entry was posted in Front Page, Spirit Filled Network on April 8, 2019 by lindsay. I’ve been angry at the Catholic Church for a while. I couldn’t tell you the last time I went to Mass and left completely and utterly fulfilled — especially in light of the church’s many, many structural failures which have surfaced over the past few decades. I work at a Catholic organization, and still technically consider myself Catholic. I desire a church that works for justice, but am not seeing it. How can these things coexist? As a result, I’ve stepped back from the church for several months, needing some space and time away. In removing myself from the institution, I have found myself to be walking through a sort of spiritual desert. The institutional Catholic Church as we know it is based on strict hierarchy; my anger stems from the fact that we, as church, cannot seem to step out of that structure in order to move forward. Why are we too often a church that continues perpetuating injustice, instead of overturning oppression? I see a parallel between my reluctant Catholicism and the way that many in our country disagree with President Trump, but still call themselves American. As angry as I am, I can’t quite sever my ties to Catholicism. I’ve discovered that there is something valuable, even holy, in righteous anger. It spurs change, and enables people to work for justice. It is taxing, though, being angry at a patriarchal system that is terribly slow to change. In the same way, outrage and disagreement with President Trump and his policies are spurring new political engagement in our country. The church I desire is one of justice and inclusion. 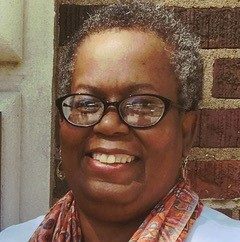 The church I wish for is one that promotes anti-racism, supports the LGBTQ community, and removes all oppressions, even as human error often gets in the way. But this does not seem to be how the present Catholic Church works, and it angers me. When thinking about the distance between the church as it is and the church I desire, and my place in the church, the Jesus who flipped over tables in outrage comes to mind. It’s a comforting image: at some point, he was frustrated with his church, too. I find it ironic that I am having these realizations at the same time as Lent, an intentional time of spiritual reflection and renewal. As the foundation of Lent, Jesus took time alone, went out to the desert, and reflected in a space of relative isolation. That idea resonates with me, and feels familiar — spending time away in order to come back restored. In this Lenten season of reflection and prayer, I am drawn towards reexamining my faith — present on the fringes of the church as it may be. What I’ve learned about the desert recently is that it isn’t a barren wasteland, as many portray it to be. 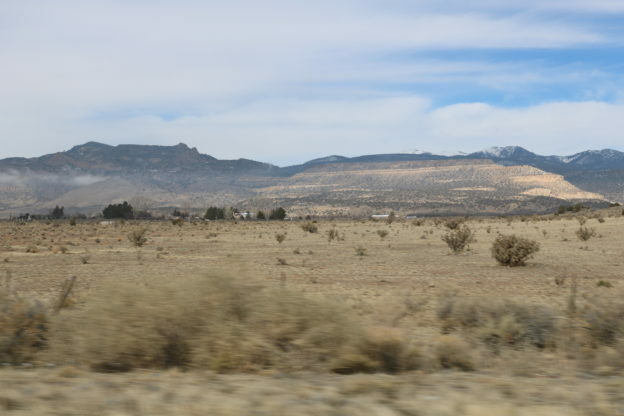 Our staff visited the desert in New Mexico in February, and found it full of life. In a space of seeming desolation, things are flourishing. In the desert there is beauty, still: life adapting to circumstances it has been given. That image is applicable to how I’ve been experiencing my faith lately: seemingly dead and empty, but quietly, blooms a cactus. There is life amidst the apparent emptiness; it’s just different than what we think it may look like. I’ve realized that my anger is well-founded, and this has allowed me to channel my spirituality into practices that make me feel most whole: journaling, the Examen, building community with those experiencing homelessness. My faith has often felt like the desert: seemingly empty and scorched. But Jesus went to the desert, too. And the desert continues on, with life teeming in small, but important ways. This entry was posted in Emerging Justice Seekers, Front Page on April 4, 2019 by lindsay. Tell us a little about yourself and the work you do. I am a progressive entrepreneur and investor working to end poverty and ensure that everyone can live with financial security and afford life’s basic needs. I co-founded Aspiration.com, an online financial institution that allows people to bank, invest, and spend in accordance with their values. In 2015, I helped convinced California lawmakers that our state needed to pass an Earned Income Tax Credit, one of the most effective anti-poverty policies in America. It is a cash back program that rewards work and provides needed support to predominantly single mothers, people of color, and children growing up in poverty. When they agreed but failed to put any outreach money into the program, I created a non-profit organization called CalEITC4Me to ensure every eligible Californian would get the credit they’ve earned. Over the past three years, our innovative ‘surround-sound’ campaign has helped more than 2 million low-income CA families get over $4 billion in tax refunds. In 2018, I founded Working Hero Pac a people-powered political organization to support elected leaders and candidates who champion policies that support low-income people. This year, I created a national advocacy organization called Working Hero Action. Its goal is to elevate poverty in the 2020 presidential election while reaching hundreds of thousands of low-income workers who are not yet claiming the EITC that they’ve earned, leaving billions on the table. I’m most passionate about the solving the crisis of poverty — poverty of housing; poverty of health care; poverty of education and poverty of freedom from discrimination and prejudice — that afflicts a super-majority of Americans and stymies their ability to live the fullest, most human life as I believe God intends for all of us. My mission is nothing less than an end to poverty. This country has the tools to do it; what’s missing is the political will. That’s why I’ve been working through Working Hero PAC to support political leaders who share my mission, and Working Hero Action to advocate for policies that will help all Americans afford their basic needs. I am the founder of a California-based organization called CalEITC4Me that connects working families to the resources they need to claim their government refund from their EITC. Millions of EITC dollars go unclaimed every year, simply because so many of the people who are eligible and simply don’t know about it, don’t know how to claim it, or don’t earn enough to have to file taxes. For working families experiencing poverty, that amount of money — up to $6,000 — can be life-changing. So our job is to make sure that every family that’s get the money they’ve earned. In the past three years, our campaign has connected more than 2 million California families with more than $4 billion of tax credits, and this year we’ve expanded to Iowa and South Carolina as well. The movement is growing. My advocacy for social justice and the impact we’ve been able to create has made me more optimistic about the future, even as I see more and more suffering. My experiences have affirmed my belief that our problems are almost always the consequences of bad choices and failed democracy, where our leaders have strayed from the will of the people. I find hope in that, because that means with better choices and a healthier democracy, we can reverse course and start to solve these problems. My Jewish belief in the directive of “Tikkun olam” is my source of energy and inspiration every day, and especially on the hard days. Tikkun olam means that we each have a responsibility to do everything we can and make the best use our abilities to repair the world and help others. Is there a quote that motivates or nourishes you that you would like to share? What was your biggest accomplishment as an activist in the past year? While I don’t want to call it a personal accomplishment, one of the things that I’m most proud of is the fact that our advocacy & activism in California has led to a dramatic expansion of the EITC over the last two years. In 2017, CalEITC4Me led a grassroots organizing campaign that won a massive expansion of the program to include self-reported freelance income—work, done disproportionately by women and people of color. And then last year, in response to our calls, texts, and emails, the legislature expanded eligibility once more to include workers age 18-24 and over age 65, meaning this tax season more working families now qualify for the EITC than ever. Now, as one of the signature proposals of his first term, Governor Gavin Newsom is proposing more than doubling the California EITC to $1 billion. This is an incredible validation of how successful the program has been, and a testament to the work of our community partners. What are you looking forward to working on in the coming months? Right now, all my focus is on tax day on April 15. For the next two weeks, Working Hero and CalETIC4Me are going to be doing everything we can to ensure that every eligible family in California, Iowa, and South Carolina files their tax return and receives the cash refunds they’ve earned. Once tax season is over, we’ll turn to our broader mission: advocating for policies to end poverty and help all Americans afford their basic needs, including expanding the EITC and passing policies like the Green New Deal and Medicare for All. This entry was posted in Front Page, Spirit Filled Network, Taxes on April 2, 2019 by lindsay. 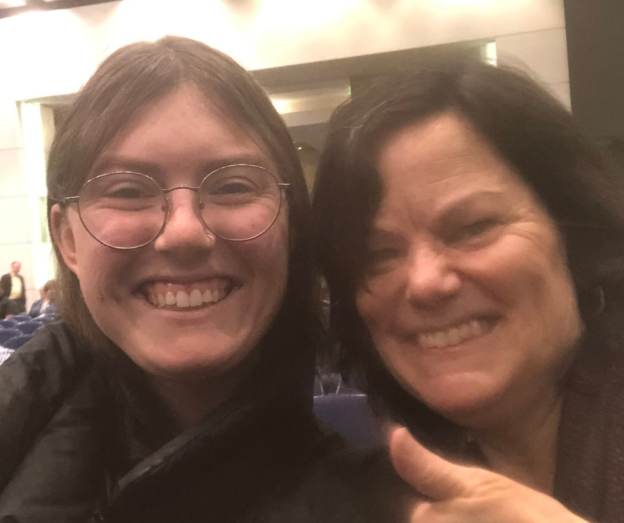 This past week, my colleague Laura Peralta-Schulte and I had the opportunity to travel to Cedar Rapids, Iowa and represent NETWORK at the 20th annual White Privilege Conference. This conference was founded to examine the ideas of privilege and oppression and create space to work towards building strategies for a more equitable world. 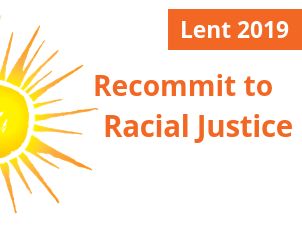 For those of you participating in our Lenten reflection guide, you know that this Lent we are Recommitting to Racial Justice. The past two weeks, the reflections in the guide have been produced from our educational workshop on the racial wealth and income gap. We examine 12 federal policies and reflect on the ways in which each policy worked in order to create and perpetuate the racial wealth gap that exists today. Laura and I facilitated this workshop to over 50 other attendees. The reception was overwhelmingly positive. It is always exciting to spread the good work that NETWORK is doing to new audiences. This was the second year that NETWORK staff have attended this conference. The presentations we attended ranged on topics from compassion as anti-oppression work, to the intersections of patriarchy and white supremacy, to embodied racial justice. Laura and I attended different presentations each session with the goal of gathering as much information in those four days as possible to bring back to the rest of our NETWORK community. As I work to put my reactions into words for this blog, my thoughts and feelings after attending this conference, I am realizing the ways in which I am very much still processing the experience and all of the wisdom and expertise that was shared with me as a white person. I am deeply grateful for the opportunity to attend this conference, and the ways in which NETWORK intentionally makes space for the ongoing work of racial justice amongst staff members. This entry was posted in Emerging Justice Seekers, Front Page, Income, Mend the Gap, Racism, Spirit Filled Network on March 28, 2019 by alannah. When I first was introduced to Hamilton, it was during the 2016 election. Every morning I listen to NPR to stay up to date on current news, but as I listened then to Trump’s growing support and then saw him win the Republican nomination, I felt my hope for this country fade away. So I switched to listening to Hamilton every morning. Listening to the musical spreads the notion that America is this great unfinished symphony — where an orphan immigrant can make a name for himself. I’m obsessed with Hamilton because it’s the most beautiful underdog story I ever heard: about a kid who, his whole life, had to fight against an everlasting hurricane wanting to wash him away. In “Alexander Hamilton,” the cast sings, “The ship is in the harbor now. See if you can spot him. Another immigrant comin’ up from the bottom.” Who would have thought that someone in that crowd would be one of the founding fathers, the architect of the modern U.S., the architect of the financial powerhouse we are – who would create more things that outlived him and anyone else before him? I bet that’s what history will say of Dr. Alfredo Quiñones-Hinojosa (undocumented farmworker to internationally renowned neuroscientist and neurosurgeon), Rep. Ilhan Omar (MN-5), and us. Both Dreamers and TPS holders are Americans in every way. You never find a shortage of these amazing stories of people who are defying the odds, because that’s how we were raised and how America raised us to be; to defy the odds. We had the tenacity to defy those who said we would never go to college, contribute to our country, or say we couldn’t pass a background check. The musical shares that Alexander Hamilton wanted to create a system that truly allowed people like him to make a name for themselves in this unfinished symphony. That’s what the U.S. inspires people to be: a country where immigrants who come from nothing and are nothing, can work tirelessly to create systems that outlive them. That’s why there’s no shortage of successful Dreamers and TPS holders, though that’s not the reality for all of them. 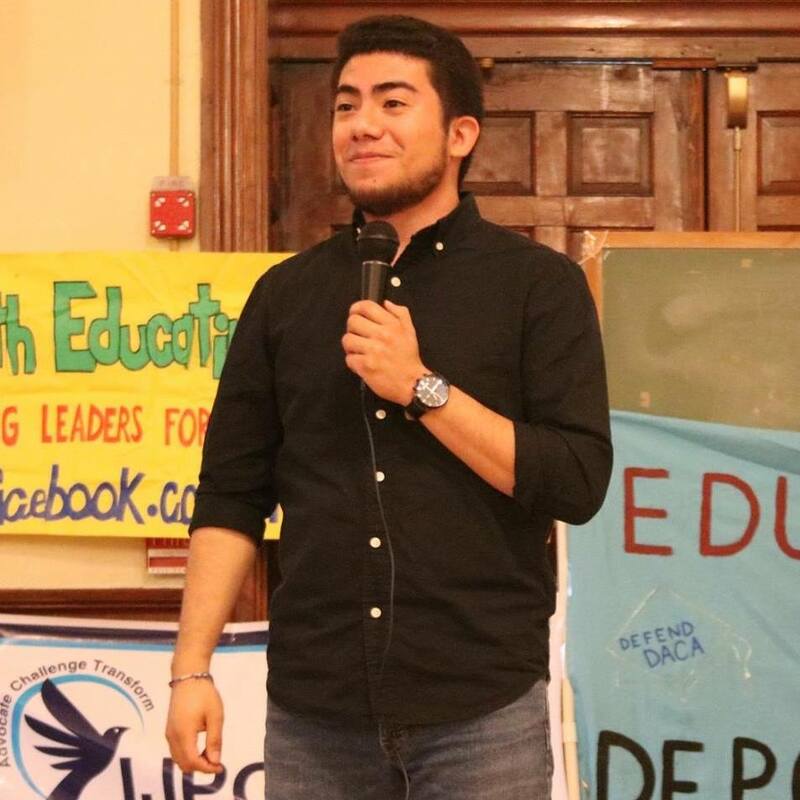 When I was an organizer in Cincinnati, many of the Dreamers who I organized with weren’t able to go to college because of the everlasting hurricanes that are trying to wash us away. For the majority of us, we didn’t see DACA coming, just deportation. The realities of being an undocumented youth are knowing that no matter how hard you worked in school, how impressive your GPA was, or how many scholarships to college you could collect; the moment you graduate you’ll watch your classmate get their dream jobs while you struggle to find a job because of your status. There were so many students – including me – who didn’t see the value of furthering their education. I saw a lot of DACA recipients who didn’t have the impressive GPA to get into the big schools and get the scholarships. And those were the Dreamers who had the money to pay for their DACA. This status gave us financial liberty that made our families depend on us. Many of us had the most secure job in our household. The DREAM-Promise Act, H.R. 6, is a good first step in truly making America an unfinished symphony. When this bill passes, so many people will finally get their pathway to citizenship. Trust me, with citizenship and passion of community organizers, America will have an overflow of underdog stories from Dreamers, TPS, and DED holders. H.R. 6 can be the 116th Congress’s legacy. This bill can be the legacy of all the organizations that are working for pro-immigration policy. Of all the immigration reform organizers. The legacy towards an immigration reform bill that will give a pathway to citizenship for 11 million undocumented immigrations. It’s our legacy. This entry was posted in Emerging Justice Seekers, Front Page, Immigration on March 22, 2019 by lindsay. This entry was posted in Front Page on March 18, 2019 by colleen.